The dominant theme in next year’s Senate elections is the confluence of two competing forces: The huge number of seats the Democrats are defending versus the usual boost that the non-presidential party, in this case the Democrats, enjoys in midterm elections. On one hand, Democrats are defending 25 of 33 seats, the most overextended any party has been in a midterm since 1970. On the other hand, the president’s party typically loses ground in the Senate in midterms: The average loss is about four seats per election in the 26 midterms since 1914, the first year Senate popular elections were instituted nationally. The reelection rate for non-presidential party Senate incumbents in midterm general elections is also significantly stronger than presidential party incumbents, as we noted in our last Senate ratings update: it’s 91% for the non-presidential party incumbents versus just 75% for the presidential party ones. Still, non-presidential party incumbents do sometimes lose in midterms, and several seem vulnerable in this election: We rate two Democratic incumbents, Sens. Joe Donnelly (D-IN) and Claire McCaskill (D-MO), as Toss-ups, and six others are in the vulnerable Leans Democratic category. It would be a surprise if Democrats saved all of their incumbents this cycle, even if the national environment breaks in their favor next year. If one or more Democratic Senate incumbents lose next year, they will be added to the list of non-presidential party midterm incumbent losers in the Senate, which currently numbers 27. Table 1 lists these midterm losers. They merit a closer look. Of the 27 non-presidential party general election midterm incumbent losers, 17 were Republicans and 10 were Democrats. The main reason there are significantly more Republicans than Democrats listed is because eight of the 27 — close to a third of all the examples — were Republican incumbents who lost in what is really the only midterm wave in favor of the president’s party in the history of our current two-party system: the 1934 Democratic advance in President Franklin Delano Roosevelt’s first midterm, which saw Democrats beat eight incumbent Republican senators. “No previous President half way through his term ever won such an overwhelming popular endorsement as Mr. ROOSEVELT received on Tuesday,” the New York Times observed after the election, and the observation is as true today as it was more than eight decades ago. More than half of the non-presidential party Senate losers lost in what are arguably the four best midterm performances by the president’s party in the century studied: the aforementioned 1934, as well as 1962, 1998, and 2002. The latter two examples, as well as Roosevelt’s first midterm, are the only three midterms in this time period where the presidential party made gains in the House, although those gains were all only in the single digits. Additionally, 1962 featured only a minor presidential party House loss — the Democrats lost just five seats — and Democrats ended up netting four Senate seats that year. A major commonality among these four elections was the popularity of the incumbent president, which almost assuredly contributed to the ability of his party to mitigate the usual presidential party midterm blues: John F. Kennedy (1962), Bill Clinton (1998), and George W. Bush (2002) were all over 60% approval in either Gallup (Kennedy and Clinton) or the broader RealClearPolitics average (Bush). And while George Gallup’s measurement of approval rating only started later in FDR’s presidency, had the pollster been measuring Roosevelt’s approval rating in 1934, he almost assuredly would have found FDR well north of 60%. It is perhaps not surprising that there were no non-presidential party Senate incumbent losers in some of the great wave years that broke against the White House over the past century: 1938, 1946, 1958, 1966, 1974, and 1994 did not feature any out-party Senate incumbents losing, nor did any of the last three midterms (2006, 2010, and 2014), all of which can fairly be categorized as waves against the White House. Of the 27 names on Table 1, 15 come from the four previously mentioned midterms where the president was popular and his party performed relatively well in the midterm: 1934, 1962, 1998, and 2002. It makes sense that a strong president with good approval could allow his party to overcome the usual midterm hurdles and gain ground as opposed to losing it. But there are other factors worth considering, too, including changing political conditions in some of these states. 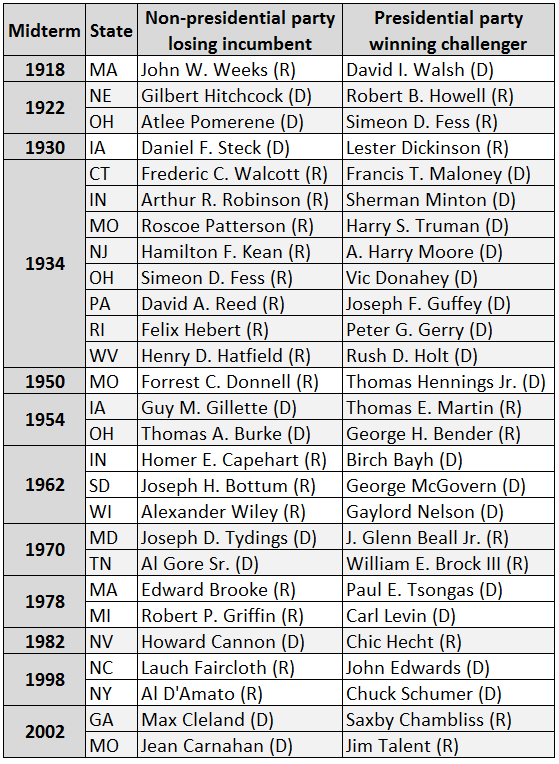 For instance, 1934’s long list of Republican Senate losers includes Sen. Felix Hebert (R-RI). Six years earlier, Hebert defeated Sen. Peter Gerry (D). Gerry returned the favor, becoming the last former Senate incumbent to come back and defeat the person who had taken his seat six years after losing it. Gerry’s ability to win back the seat didn’t just have to do with the Roosevelt wave: It also was arguably aided by the Ocean State’s turn toward the Democrats. From the Civil War through the start of the New Deal, only one Democrat — Gerry — had won a Senate election in Rhode Island. He did so in 1916 and 1922 before losing to Hebert in 1928. After the start of the New Deal, only two Republicans have since won Senate elections in now-heavily Democratic Rhode Island: moderates John Chafee and his son, Lincoln, who is now a Democrat. The same dynamic probably contributed to some other out-party incumbent defeats. In 2002, Sen. Max Cleland (D-GA) lost a tough election to now-former Sen. Saxby Chambliss (R-GA) in a state that had only elected a couple of Republican senators since Reconstruction but now elects them consistently. That George W. Bush had a 70% approval rating in Georgia leading into that election certainly didn’t help Cleland either. Cleland also had barely won his previous election, in 1996 — indeed, some of the other election losers on this list had rather tenuous grips on incumbency. Sen. Al Gore Sr. (D-TN) had won a third term by less than 10 points in 1964 — a far-reduced margin from his first two victories — and future Republican National Committee Chairman Bill Brock (R-TN) beat him in 1970. The South’s slowly emerging Republican trend undoubtedly helped the conservative Brock defeat the liberal Gore, who criticized the Vietnam War and supported civil rights. Still, even after this election the Volunteer State was hardly closed to Democrats — six years later, Jimmy Carter carried it and all of the South outside of Virginia, and Jim Sasser (D) beat Brock. Later, Tennessee would elect Gore’s son to the Senate and back the Clinton-Gore presidential ticket in both 1992 and 1996, but not Al Gore Jr. in his bid for the presidency in 2000. More recently, the 1998 loss by Sen. Al D’Amato (R-NY) to current Senate Minority Leader Chuck Schumer (D-NY) may have been foreshadowed six years earlier. D’Amato had only won by a little more than a point in 1992, which was the last time a Democrat failed to win a New York Senate race by double digits (Schumer beat D’Amato by a little over 10 points in 1998). Schumer is hardly the only now-famous Democrat to win his first election by reversing the usual dynamic and beating a Senate incumbent from the non-presidential party in a midterm. Among the others to accomplish that feat were future presidential candidates Sens. George McGovern (D-SD, first elected in 1962), Paul Tsongas (D-MA, 1978), and John Edwards (D-NC, 1998), as well as future President Harry S. Truman (D-MO, 1934). Other notable Democrats who emerged from such races were Sens. Carl Levin (D-MI, 1978), Birch Bayh (D-IN, 1962), and Gaylord Nelson (D-WI, 1962). So perhaps a lesson is that strong challengers can help reverse the presidential party midterm jinx, particularly if the president is not a drag on the ticket: None of the years mentioned here were waves against an unpopular White House, including 1978, which featured only relatively small federal net losses for Democrats during the only midterm for the then-not-yet-toxic Carter. Poor ethical conduct, or even the accusation thereof, helps make sense of a couple of the remaining non-presidential party incumbent losers. Sen. Howard Cannon (D-NV) was ensnared in a bribery probe in advance of the 1982 election, and he barely won renomination before losing to Chic Hecht (R-NV) in the general election. Sen. Edward Brooke (R-MA), the first African American to win a popular election to the Senate (in 1966), faced financial questions stemming from his divorce in the leadup to his loss to Paul Tsongas in 1978, and he too faced a competitive primary, which is often a sign of weakness. Also hurting Brooke in 1978, strangely enough given the way the issue has developed over time, was his support (as a liberal Republican) for abortion rights, which earned him the ire of some Catholics in Massachusetts, then and now a very Catholic state. Since Brooke’s 1972 victory, Republicans have only won one Senate election in deep blue Massachusetts: Scott Brown’s special election win in early 2010. Or sometimes incumbents made self-inflicted mistakes. A year and a half before the same election that Brooke lost, 1978, Sen. Robert Griffin (R-MI) announced that he would not run again, saying that it was time for new blood in Washington. Then he changed his mind under pressure from party leaders and sought reelection anyway. “In effect, the senator wrote the text for his opponent,” as the Washington Post noted right before the election, and Levin — who went on to serve six terms — took advantage. Other incumbent losers on this list were not regarded as dynamic campaigners, such as Sen. Atlee Pomerene (D-OH), known as “the gloomy senator” who lost in 1922. Pomerene also did not support women’s suffrage nor Prohibition, which arguably hurt him. Opposition to women’s suffrage may have also hurt Sen. John W. Weeks (R-MA) in 1918; both Pomerene and Weeks lost in what were otherwise classic midterm waves in favor of their respective parties. Appointed senators generally do not have the incumbency advantage that elected ones do, so it’s not a surprise that a few of the senators on this list were appointed incumbents who lost bids to win in their own right. In 2002, the other Democratic incumbent (along with Max Cleland) who lost was Sen. Jean Carnahan (D-MO), who lost a close race after she had been appointed to the seat following her deceased husband Mel’s posthumous victory in 2000. Another appointee, Sen. Thomas Burke (D-OH), lost by less than a point in 1954 to George Bender (R-OH), who then himself lost two years later to Gov. Frank Lausche (D-OH), who had appointed Burke to the seat to replace the deceased Sen. Robert A. Taft (R-OH), a Republican legend. Sen. Joseph Bottum (R-SD) is the other appointed senator on this list who was rejected by the voters, albeit in a very close race to the aforementioned McGovern. Both Burke in 1954 and Bottum in 1962 lost by identical and agonizing 50.1%-49.9% margins. Another non-presidential party incumbent who lost in a midterm wasn’t an appointee, but his initial election wasn’t exactly traditional. In 1924, Daniel Steck (D-IA) appeared to lose a very narrow race to Smith Brookhart, a progressive Republican who had won a special election two years earlier and was running for a full term. Brookhart did not support Republican presidential nominee Calvin Coolidge — Progressive Robert La Follette ran as a credible third party candidate that year — which enraged Brookhart’s fellow Iowa Republicans, who did not support his campaign. After the election, Steck challenged the result, alleging voting irregularities, and Iowa Republicans challenged the results as well, arguing that Brookhart wasn’t really a Republican. Eventually, the Senate narrowly voted in 1926 to unseat Brookhart and seat Steck, who became the first Democrat to represent Iowa in the Senate since the Civil War. It’s perhaps not shocking that Steck then lost in 1930 given Iowa’s strong history of electing Republican senators and the odd circumstances of his initial “victory,” even though Democrats otherwise performed very well across the country that year as the Great Depression worsened (Iowa would soon elect other Democratic senators, though). Ultimately, there are all sorts of factors that contribute to a Senate incumbent losing, and individual state experts could surely expand upon the reasons why individual out-party incumbents lost their seats. But, generally speaking, there is at least one big and hardly profound takeaway: If President Trump can build upon his recent approval uptick — he’s back around 40%, although there have been some signs that he’s falling back again — that could help Republicans across the board, because typically one only sees significant non-presidential party Senate incumbent losses under popular presidents. If he stays where he is or declines, that probably reduces Republican chances to knock off more than one or two Democratic incumbents. However, just because we’ve never seen an unpopular president’s party knock out several Senate incumbents from the other party doesn’t mean it can’t happen. The Democratic vulnerability next year is clear, both in the volume of seats they are defending and the deep Republican lean of several of those states. If such a GOP tide washed away several Democratic Senate incumbents while an unpopular Republican held the White House, it would be essentially unprecedented. In other words, it would fit right in with the 2016 election that broke many “rules” of politics.